Dance history has some deeply entrenched myths. One is that ballet has always been an aristocratic art form, created and performed for the elite in Europe’s foremost opera houses. Another is that ballet nearly disappeared in France at the turn of the twentieth century, saved only by the timely appearance of Sergei Diaghilev’s Russian ballet in 1909. While I initially accepted the first myth, I had long been puzzled by the second. I had learned in my undergraduate music history classes that Diaghilev first came to Paris with an exhibit of Russian art, and that he returned with a series of Russian concerts and then a Russian opera. In 1909, he took Paris by storm with a season of Russian ballet. Parisian audiences were enthralled and clamoured for new, more exotic, more Russian productions, and so the Ballets Russes was born. But if Diaghilev found such a vast ballet-loving audience in Paris, surely Parisians knew something about ballet. And if in 1909 Parisians were the ballet aficionados that they were fabled to be, what productions did they see as points of comparison? Convinced that Parisians must have been creating some ballets of worth, I headed off to research late-nineteenth-century ballet in Paris. Like everyone before me, I began by studying the repertoire of the Paris Opéra. I quickly determined that the history books had accurately portrayed the period as one of decline and decadence. Between 1870 and 1909, the Opéra produced very few and mostly lacklustre ballets that did reveal a stagnation of French dance. As it turns out, however, the Opéra was far from being the only venue to stage ballet at the turn of the twentieth century. What I found instead was a vibrant ballet culture that took place where I least expected it: in the city’s trendy new music halls. Between 1871 and 1913, Parisian music halls staged roughly four hundred ballets, more than half of which were produced by the city’s three most famous venues: the Folies-Bergère, the Olympia, and the Casino de Paris. At the turn of the century, all three were variety theaters that presented nightly programs of circus and acrobatic routines, song and dance acts, and performing animals, along with at least one ballet or other theatrical production such as an operetta or pantomime. Although now remembered almost exclusively for variety acts such as Little Tich, La Belle Otéro, or the Sisters Barrison, at the time, the halls were at least as celebrated for their ballets. My book, Parisian Music-Hall Ballet, 1871-1913 (University of Rochester Press), brings this popular dance culture to light. Folies-Bergère program, 20 November 1898. Music-hall ballets were initially divertissements, short, virtually plotless illustrative numbers danced by a ballerina and a small groups of corps girls. Some ballets were simple love triangles or romantic comedies, others depicted flirtatious wood nymphs and fauns, or alluring fisherwomen and bathers, and still others had no narrative at all, instead presenting series of character dances in picturesque or exotic locales. There were many personifications of flowers, precious stones, animals, and insects (bees made for especially revealing costumes), and a few of toys or statues coming to life and dancing. 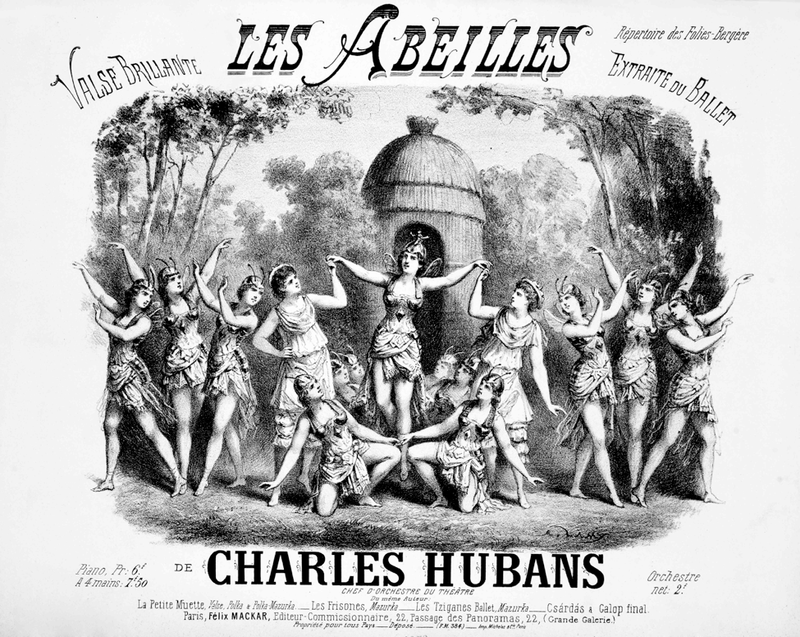 As music-hall ballet gained a popular following and attracted the attention of theater critics, the Folies-Bergère, later emulated by the Olympia and the Casino de Paris, began creating new ballets at a rate of four to six per year and producing them on an ever grander scale. R. Lamy, drawing on the cover of Charles Hubans, Valse Brillante from Les Abeilles [c.1877]. By the late 1890s, all three halls were staging 30- to 90-minute long ballets that mixed pantomime, dance, and music to tell a story—usually a romantic comedy, but sometimes a historical spectacle, a mythological parody, or an exotic tale of temptation and seduction. In structure, these ballets resembled Opéra productions, with one to three acts made up of roughly equal proportions of pantomime and dance and with many of the same types of scenes and dances. However, music-hall ballets also had some distinctive traits. All had catchy music written by the great operetta and comic opera composers of the day, most included some form of titillating choreography or a striptease scene along with more traditional character dances and classical ballet, and all had spectacular sets and costumes. Most importantly, along with internationally renowned star ballerinas, music-hall ballets boasted a stage full of pretty corps girls, often decked out in fetching travesty outfits of tight trousers and fitted bodices. 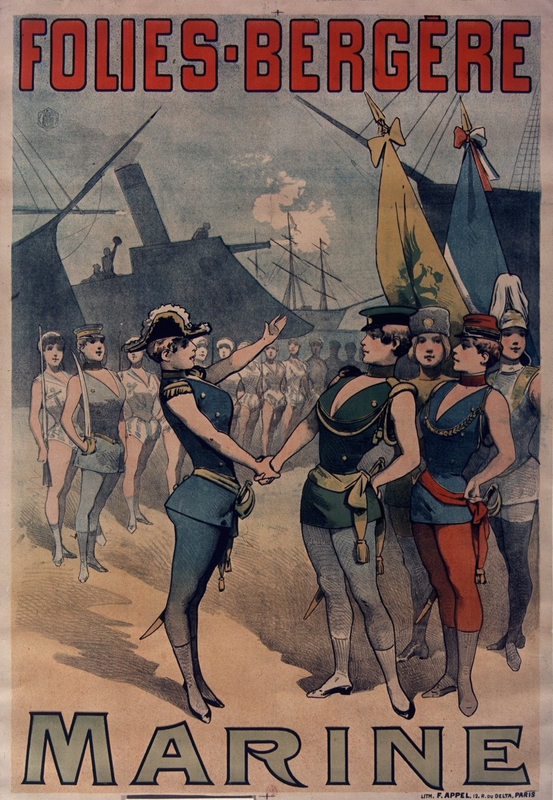 F. Appel, Folies-Bergère poster for Marine, 1890. These productions, which deftly combined the conventional structures of high art with the popular idioms of mass entertainment, drew larger and more varied audiences than had ever before attended ballet. Ballet had become everyday entertainment for a broad public. Paradoxically, while music-hall ballets were created as entertaining ephemera, they had a profound impact on Parisian dance culture and played a significant role in the renewal of French ballet. Not bound by the strictures of classical ballet, music-hall authors and choreographers introduced novel approaches to the genre, fostered a more flexible notion of what “ballet” could be, and cultivated an audience that could appreciate choreographic innovation: the same audience that flocked to see the Russian ballet in 1909. By looking to new sources of inspiration and drawing on the most successful trends in popular art and entertainment, music-hall authors, composers, and choreographers created works with an originality and flair not seen in Paris for decades. These artists and entrepreneurs infused the genre with a vitality long lost at the state theater and brought ballet into the twentieth century. Sarah Gutsche-Miller is Assistant Professor of Musicology at the University of Toronto.